Red and gold furniture was commissioned from artisans in southern China by wealthy Straits Chinese merchants in the Straits Settlements of Singapore, Malacca and Penang in the nineteenth and early twentieth centuries. The Straits Chinese (also known as the babas and nonyas and also as the peranakan) were distinctive from most of the Chinese on the Malay peninsular at that time. Their families had been on the peninsular for at least several generations and often they were the product of intermarriage between local Chinese and Malay population. Their customs were a curious blend of English, Malay and Chinese customs. Weddings were very important. For these, furniture for the bridal chamber often was commissioned from China. The chest-of-drawers shown here is one such example. 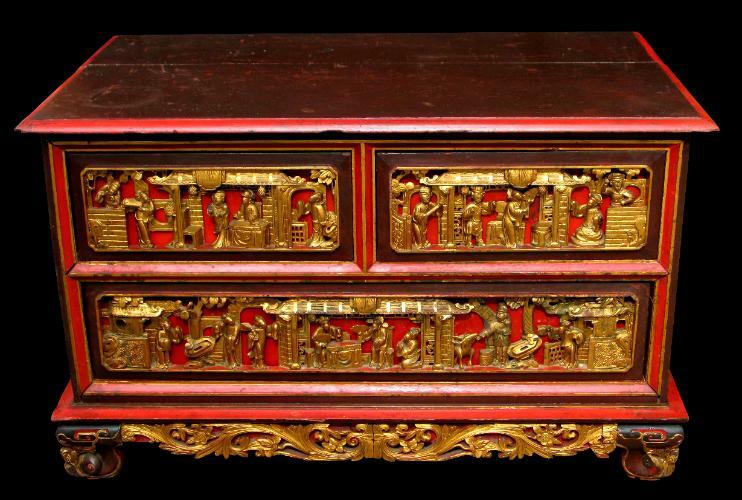 It comprises two top drawers and one larger bottom drawer, the fronts of which are elaborately carved in high relief with what appear to be courtly scenes (see detail below), painted in red and brown and gilded. The chest-of-drawers sits on four rococo cabriole feet with an elaborate gilded floral and foliage lower aprons to the front and sides. The chest-of-drawers has some later but nonetheless old additions to the lower aprons . A similar example is illustrated in Ho Wing Meng, Straits Chinese Furniture: A Collector’s Guide, Times Books International, 1994, p. 106.